Guide Cracks (aka Honeymoon’s Over) are four short, fun, well-protected cracks to two shared bolted anchors 80 feet off the deck. 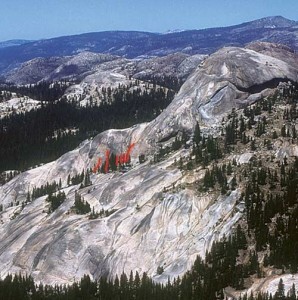 Very popular with the Yosemite Mountain School and climbers introducing friends to cracks, they are often gang-toproped and too crowded to get on. If climbing here, please be considerate and don’t hog the climbs. Which SuperTopo guidebooks include a topo for Guide Cracks?